so tom is in for the last run, and plan is to go mildly and see the first 2 gears through and then let it loose. the lights drop and the other bike, a chambered RD, takes off fast while tom just rolls out of the line as if he is moving from a traffic light and we can hear people laughing. but the bike mildly hits the powerband and it starts to move harder, and tom is about to slip into 2nd gear when our earlier mistake bangs us hard - the seat slips and slides away from under tom. cutting back on the throttle, tom somehow eases the seat back onto the frame, and struggles to refind his position. more time lost and the other bike is way ahead and blazing away to the finish. 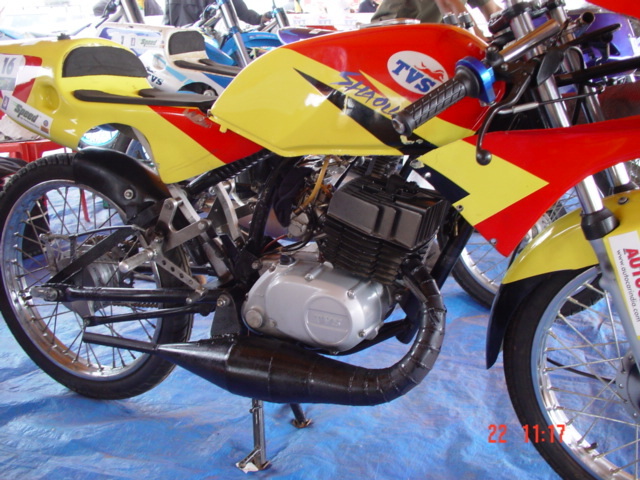 but this time, the bike slips into 2nd gear easily since the revvs are down, and soon tom finds 3rd gear as well and then the throttle is whacked open and the bike comes into its own for the first time that day. 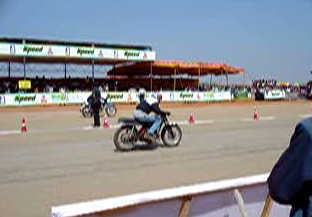 very soon the other bike is gobbled up somewhere past the 300 meter mark or so, and the tom goes past the finish at a good 140kmph. on a day full of disasters, something to cheer about in the end. anyway we take the bike back, and rack our brain for a few hours checking the bike, the clutch, gearshift etc. we open the whole damn clutch, even replace the clutch plates, clean up everything. we cant open the gearbox anyway, and we dont have time too. so most of us get drunk and split for the day in rather gloomy moods. so the next day finds us all back in jakkur airstrip and today we have the race runs. for some reason we are all back in an optimistic mood and we just have this hope that yesterdays was a freak phenomenon, which might not even show up again, ever. we remember to stock up with some beers and soon we find a place in the pits and park the bike out there. 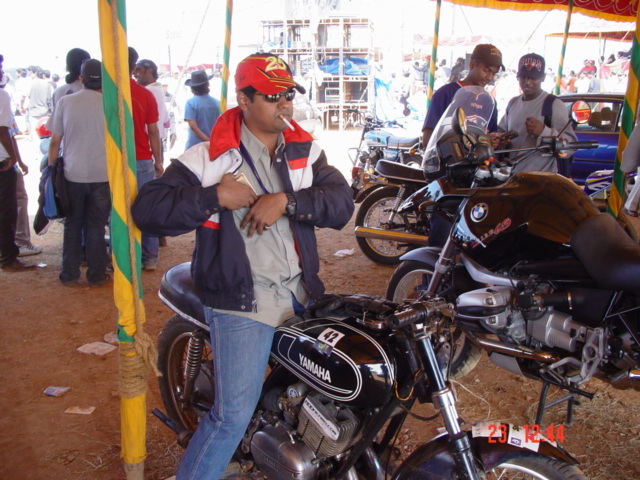 there is jaggu armed with a ciggy guarding the bike and you can see anands big bmw right next to it. there is quite sometime for the runs to start and we have a nice time walking around the pits peeking at the various bikes out there. 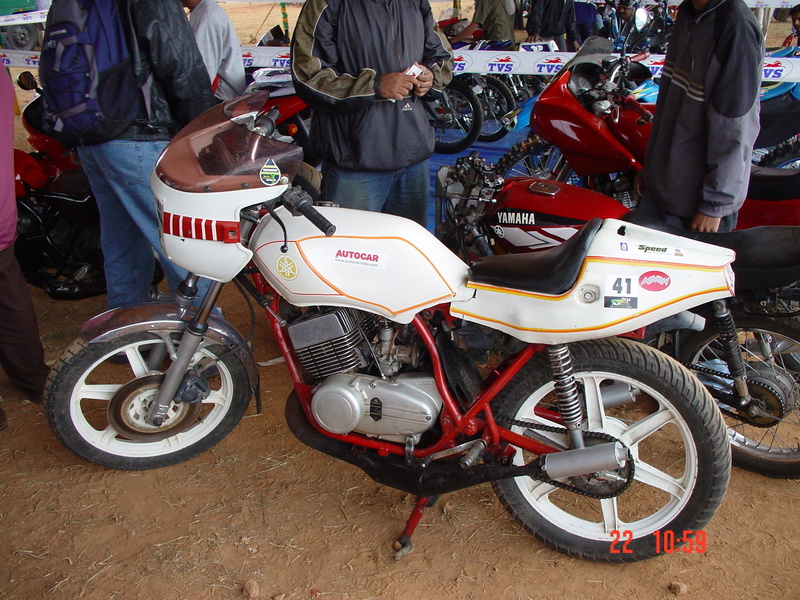 rajan joshuas bike is there and we are surprised to see the neat bike, its running stock carbs and local filters. thats where the small things end and the bike is fast, and easily crosses 145 at the finish.